Funny situation is in the headquarters of Facebook. Previously, social network preferred to give their employees only smartphones iPhone to those tested mobile client Facebook. But over the last few years the market has changed. 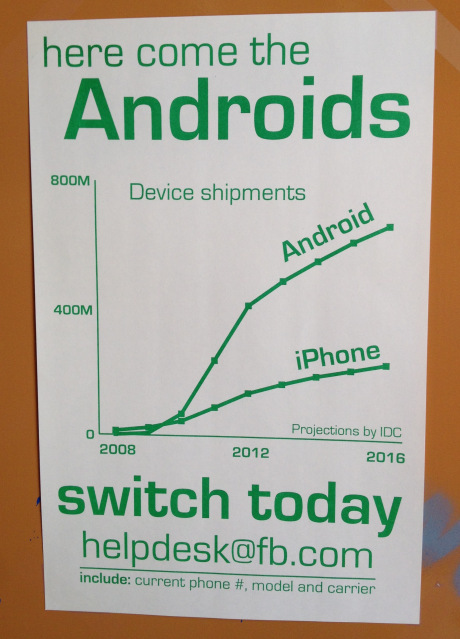 Android smartphone first caught up with the iPhone, and now completely bypassed its sales in the future, this trend will only increase. But in the vast majority of Facebook employees use it iPhone, and may not adequately test the mobile client for the platform, which is becoming increasingly popular among users of the social network. Therefore, at the headquarters of Facebook spent the whole advertising campaign aimed at ensuring that the staff switched to Android, according to TechCrunch. 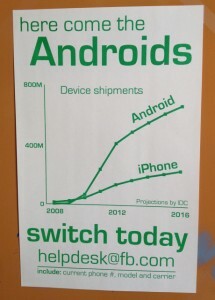 The campus headquarters Facebook hung posters calling to move to Android. The term “dogfooding” (as interpreted by Facebook “droidfood”) refers to companies / developers to use their own product, not only making it to the user. This term was coined by one of the early television commercials, which broadcasts live. It advertised the dog refused to eat dog food. However, as the representative of Facebook, the campaign had to be suspended until, as the number of employees exceeded the number of conscious commitment of Android smartphones. Enthusiasm of the staff with regard to Facebook’s mobile operating system Google, however, is still not as great as one would like to recognize the company. The staff is still in the right to choose their own smartphone, which they want to use, and very often the Android for them plays the role of a second, optional. Actually, the whole story is very well illustrated by the vector of development of the market of mobile applications for the next few years. While it is a struggle between Android and iOS, and this is not a pity, but for Windows Phone 8, BlackBerry 10, Jolla, webOS, Firefox OS, and other platforms, this fight just might not be the place. It requires a tremendous impetus to the development, to somehow hook and affect the collision of two “heavyweights”. It is more likely to have Windows Phone, by supporting large manufacturers. In most Microsoft has recently talked about how they expect to be the third in the smartphone market, but that the size of this share can be quite small. 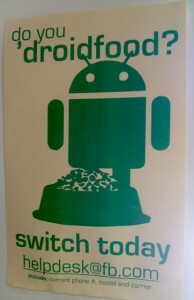 This was all regarding, why and how Facebook asked its employees to switch to Android instead of iPhone.